At the Virginia Film Festival in November I was privileged to view the film, “Mandela: Long Walk to Freedom.” As a writer, I always come with a notebook and a pen, but in a darkened theater it is difficult to jot down ideas or good quotes. So moved was I, though, by his words spoken to close the film – the message of a life – that I found a small bench in the hallway and, fending off the throngs exiting past me, I sat scrawling frantically so I wouldn’t forget. who every nation today calls their favorite son. As Pastor Trevor Hudson said of his countryman, “Even in his death, this man is uniting a nation.” And today that nation, though mourning, is also dancing in celebration. That is the African way: lively, colorful, rhythmic, festive, full of heart. A particular moment remains with me from my viewing of the film. Black South Africans have just received the right to vote and Mr. Mandela is seeking election as their President. There is a line extending for miles in the distance of black South Africans executing their new right. At the front of this line a young woman walks into a small building, pushes her paper ballot through a slot in a wooden box, and exits the building shouting and dancing and singing. And the line joins her in her celebration. In my hometown a couple of weeks later, I cast my ballot because of this woman. And I lament. On that day in Virginia, not a single voter, coming or going, even wears a smile. The choice we have is among candidates who have not distinguished themselves as honorable, trustworthy or deserving. What a contrast. Where has our life and vigor gone? 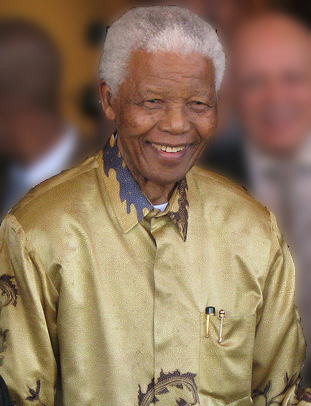 Today, we pause to celebrate the life of Nelson Mandela. A man who President Obama has said, “took history in his hands and bent the arc of the moral universe toward justice.” Mandela was resolved, disciplined, dignified, smart, committed, and charismatic. He healed a nation. He was his country’s conscience. He said follow me and they did. Read other wisdom of Nelson Mandela here. One man’s life healed a nation. Can the death of One Man heal a world? Nelson Mandela’s life renews my hope that it can, and it will. Posted on December 6, 2013, in Body, In Action, Life and tagged inspiration, Mandela: Long Walk to Freedom, Nelson Mandela, race relations, reconciliation, South Africa, Trevor Hudson, Virginia Film Festival. Bookmark the permalink. Leave a comment.